What goes best with meat loaf?? 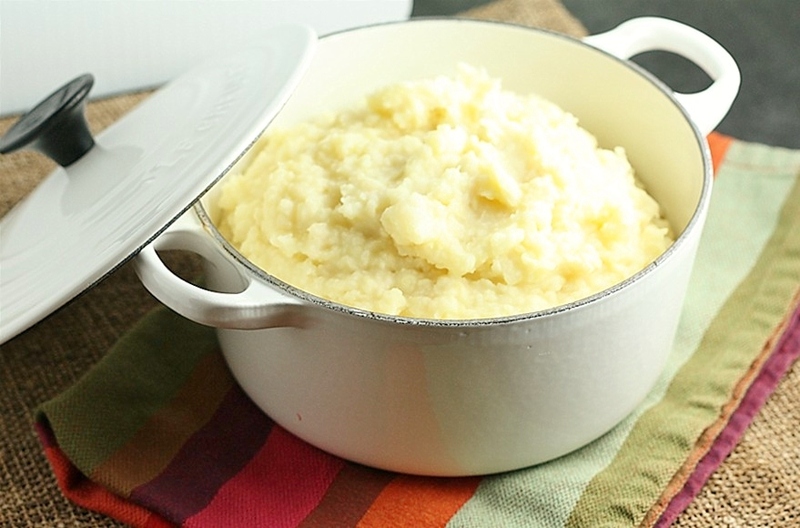 You guessed it – mashed potatoes. There is nothing like dipping that meat loaf into a nice soft pile of mashed potatoes. So – I have told this story before, but it is so good, I have to tell it again. Both of my kids hated potatoes for the longest time – except for french fries, which really don’t count. It didn’t matter how I made them, they were never good enough. That was until I made these – and the fact that they were not fried, and made from real mashed potatoes – made them a complete success. One day though, my daughter mentioned that her “cooker” at day care made mashed potatoes, and she actually ate them. I was floored. How could a woman who is cooking for 100 kids, make better mashed potatoes than me? Turns out, they were not real. Figures. I then went on a mission to make mashed potatoes that my kids would like. It took years for that to happen, but last year at Thanksgiving, they both loved the mashed potatoes. Place potatoes, celery root, and horseradish in a large pot. Add water to cover by 1″. Bring to a boil, reduce heat to medium-high, and simmer until vegetables are tender, 25-30 minutes. Drain, reserving 1 cup cooking liquid. Return vegetables to pot; add sour cream, Dijon mustard, and butter. Using a potato masher, coarsely mash vegetables. Add reserved cooking liquid by tablespoonfuls if mash is too stiff. Season to taste with salt. These look amazing! I’ve actually never had celery root, but they look so good I’ll have to give these a shot. Thanks very much, you would LOVE it, especially if you like celery! Yes, you can never complain about 50% when it comes to food! Dawn – just curious…did you add the horseradish root? That seems like a lot to add, but perhaps simmering it with the potatoes and celeriac mellows the flavor a bit? Love the addition of the sour cream. Weekend before last, I added some creme fraiche to my mashed potatoes and oh my….were they good! No, I didn’t add the horseradish root (which is why I put optional) – it seems like I would have been pushing my luck with the kids. It was plenty flavorful without it. Thanks Bonnie – those other variations sound delicious!! We are excited to see Jenny and Erik this summer in Seattle!